Vermicelli kheer or vermicelli pudding is also called seviya kheer in (north India) and semiya payasam in (south India). It is a very simple to make, healthy dessert. It can be made using low fat milk. 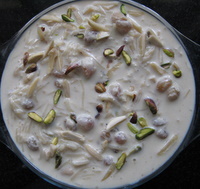 The vermicelli used in this kheer/pudding is made from semolina, unlike the Italian, which is made from durum wheat. It is called seviya in Hindi and semiya in Tamil. Boil the milk in a non stick or heavy bottom sauce pan. Simmer and stir every now and then, till it reduces to almost half the quantity. A word of caution - Do not do this on a high flame as there are chances of the milk getting burnt or sticking at the bottom of the pan. If the burnt smell/ odor comes in the milk, there is only one thing you can do with it - 'Throw it in the SINK'. Stir almost constantly to avoid the milk getting burnt. Simmering the milk may take a while, but it is the safest way to tastefully thicken the milk. When the milk is almost done, add the cardamom powder to it and the sugar (little at a time). Keep tasting and adding more sugar if needed. Meanwhile, blanch the almonds, peel and slice them into strips. chop the cashews and pistachios. In another pan, heat a Tablespoon of ghee (clarified butter), roast the nuts and raisins on a low flame for a minute or so (don't raost the raisins for too long after they swell up, this will make them taste bitter). Hence, add the nuts first and the raisins later. Once roasted, remove the raisins and nuts on a plate. In the same pan, add the vermicelli (seviya). Roast on a low to medium flame, stirring constantly. If the flame is too high, they will get burnt, so be a little careful. 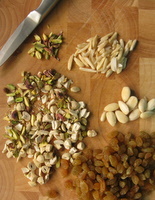 When they slightly change the color, add them to the milk, along with all the roasted dry fruits and nuts. Cook on a low heat for about 10 minutes or until the vermicelli become soft. If it appears that the milk is too much for the quantity of vermicelli, don't worry. The vermicelli will absorb more milk as it cools down. Let this get cooled to room temperature. Refrigerate it later and eat it chilled. 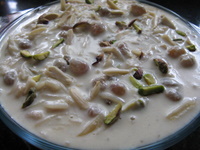 Tip - If it looks that on cooling down the kheer (pudding ) is looking too thick, then add boiled,cooled milk or cream to make it the desired consistency.